Camping Roussillonnais is a large family friendly wooded campsite that occupies a fantastic position between the Mediterranean sea and the Alberes mountains. The campsite is an ideal base from which you can explore the surrounding area which also provides a great range of activities and facilities both on-site and nearby. Covering around 10 hectares of grounds which are both well maintained and also well landscaped, Camping Roussillonnais is the perfect place to relax, unwind and enjoy a camping holiday in the sun. The sea on one side of the campsite and the mountains on the other provide the perfect backdrop at any time of the day. With direct access to a beach that stretches out for 7km you really are spoilt with a camping holiday at Camping Roussillonnais. Lifeguards patrol the beach during high season and you’ll find plenty of space to call your own. Relax in the sun, swim in the sea or play a few games, the choice is yours. If you’re looking for a campsite with a swimming pool then unfortunately you’ll be disappointed with Camping Roussillonnais. There is no swimming pool on-site however please don’t let this put you off. 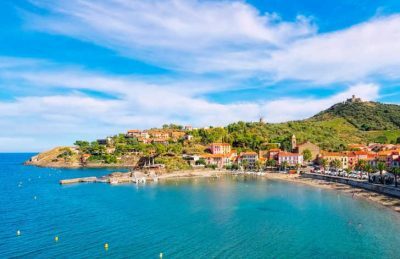 The beach and sea are perfect for families and those interested in slides will find Aqualand just 10 minutes away in nearby Saint-Cyprien. You’ll also find a number of water sports on offer nearby including kayaking, jet skiing and paddle boarding. Camping Roussillonnais campsite offers a comprehensive selection of activities and facilities on site and also nearby to ensure you have a fantastic family holiday. On site activities at Camping Roussillonnais campsite include boules, multisports area, football, basketball, volleyball, horse riding, table tennis, tennis and a playground. Facilities available at Camping Roussillonnais campsite include WIFI, restaurant, takeaway, snack bar, bar, souvenir shop, bakery, groceries, animation team, games room, washers and dryers. Accommodation at Camping Roussillonnais campsite includes a range of 1, 2 and 3 bedroom mobile homes that are available from Canvas Holidays .